When a mysterious young woman named Katie appears in the small North Carolina town of Southport, her sudden arrival raises questions about her past. Beautiful yet self-­effacing, Katie seems determined to avoid forming personal ties until a series of events draws her into two reluctant relationships: one with Alex, a widowed store owner with a kind heart and two young children; and another with her plainspoken single neighbor, Jo. Despite her reservations, Katie slowly begins to let down her guard, putting down roots in the close-­knit community and becoming increasingly attached to Alex and his family. But even as Katie begins to fall in love, she struggles with the dark secret that still haunts and terrifies her . . . a past that set her on a fearful, shattering journey across the country, to the sheltered oasis of Southport. With Jo's empathic and stubborn support, Katie eventually realizes that she must choose between a life of transient safety and one of riskier rewards . . . . . .
As a science journalist with a regular column in "Scientific American,­" Jeremy Marsh specializes in debunking the supernatural--­until he falls in love with the granddaughter of the town psychic. "Everyone wanted to believe that endless love was possible. She'd believed in it once, too, back when she was eighteen.­" In the spring of 1984, high school students Amanda Collier and Dawson Cole fell deeply, irrevocably in love. Though they were from opposite sides of the tracks, their love for one another seemed to defy the realities of life in the small town of Oriental, North Carolina. But as the summer of their senior year came to a close, unforeseen events would tear the young couple apart, setting them on radically divergent paths. Now, twenty-­five years later, Amanda and Dawson are summoned back to Oriental for the funeral of Tuck Hostetler, the mentor who once gave shelter to their high school romance. Neither has lived the life they imagined . . . and neither can forget the passionate first love that forever changed their lives. As Amanda and Dawson carry out the instructions Tuck left behind for them, they realize that everything they thought they knew -- about Tuck, . . . In the tradition of his beloved first novel, The Notebook, #1 New York Times bestselling author Nicholas Sparks returns with the remarkable story of two couples whose lives intersect in profound and surprising ways. Ira Levinson is in trouble. Ninety-­one years old and stranded and injured after a car crash, he struggles to retain consciousness until a blurry image materializes beside him: his beloved wife Ruth, who passed away nine years ago. Urging him to hang on, she forces him to remain alert by recounting the stories of their lifetime together - how they met, the precious paintings they collected together, the dark days of WWII and its effect on them and their families. Ira knows that Ruth can't possibly be in the car with him, but he clings to her words and his memories, reliving the sorrows and everyday joys that defined their marriage. A few miles away, at a local bull-­riding event, a Wake Forest College senior's life is about to change. Recovering from a recent break-­up, . . . Miles Ryan's life seemed to end the day his wife was killed in a hit-­and-­run accident two years ago. As deputy sheriff of New Bern, North Carolina, he not only grieves for her and worries about their young son Jonah but longs to bring the unknown driver to justice. Then Miles meets Sarah Andrews, Jonah's second-­grade teacher. A young woman recovering from a difficult divorce, Sarah moved to New Bern hoping to start over. Tentatively, Miles and Sarah reach out to each other . . . soon they are falling in love. But what neither realizes is that they are also bound together by a shocking secret, one that will force them to reexamine everything they believe in--­including their love. An angry rebel, John dropped out of school and enlisted in the Army, not knowing what else to do with his life--­until he meets the girl of his dreams, Savannah. Their mutual attraction quickly grows into the kind of love that leaves Savannah waiting for John to finish his tour of duty, and John wanting to settle down with the woman who captured his heart. But 9/11 changes everything. John feels it is his duty to re-­enlist. And sadly, the long separation finds Savannah falling in love with someone else. "Dear John,­" the letter read...­and with those two words, a heart was broken and two lives were changed forever. Returning home, John must come to grips with the fact that Savannah, now married, is still his true love--­and face the hardest decision of his life. Set amid the austere beauty of coastal North Carolina in 1946, "The Notebook" begins with the story of Noah Calhoun, a rural Southerner returned home from World War II. Noah, 31, is restoring a plantation home to its former glory, and he is haunted by images of the beautiful girl he met 14 years earlier, a girl he loved like no other. Unable to find her, yet unwilling to forget the summer they spent together, Noah is content to live with only memories...­until she unexpectedly returns to his town to see him once more. Allie Nelson, 29, is now engaged to another man, but realizes that the original passion she felt for Noah has not dimmed with the passage of time. Still, the obstacles that once ended their previous relationship remain, and the gulf between their worlds is too vast to ignore. With her impending marriage only weeks away, Allie is forced to confront her hopes and dreams for the future, a future that only she can shape. Like a puzzle within a puzzle, the story of Noah . . .
Ira Levinson is in trouble. At ninety-­one years old, in poor health and alone in the world, he finds himself stranded on an isolated embankment after a car crash. Suffering multiple injuries, he struggles to retain consciousness until a blurry image materializes and comes into focus beside him: his beloved wife Ruth, who passed away nine years ago. Urging him to hang on, she forces him to remain alert by recounting the stories of their lifetime together - how they met, the precious paintings they collected together, the dark days of WWII and its effect on them and their families. 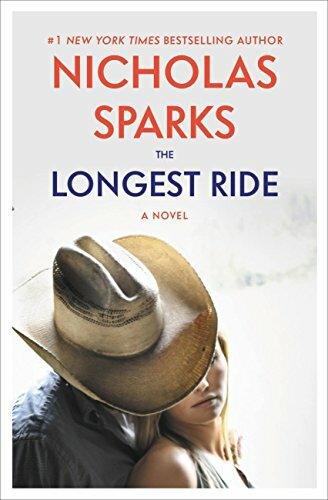 Ira knows that Ruth can't possibly be in the car with him, but he clings to her words and his memories, reliving the sorrows and everyday joys that defined their marriage.­A few miles away, at a local bull-­riding event, a Wake Forest College senior's life is about to change. Recovering from a recent break-­up, Sophia Danko meets a young cowboy named Luke, who bears little resemblance to the privileged frat . . .